Having fast hands doesn’t automatically mean fast combinations. You may notice that when you’re throwing combinations, they’re just not coming out as quick or as powerful as you want them to. Instead, your combinations are slow so your opponent is quick to avoid them or even counter you. Use the following 10 methods to learn how to throw combinations that are fast and powerful. Keep your muscles loose and relaxed are two of the most important factors in being able to throw fast combinations with power. Not only that, but it adds power to each of your punches as a result of your punches being faster and flowing more fluidly. When you’re initially starting off a combination, you never fully tighten your hands to make a fist until the moment of impact. Being tense and tight is usually a result of nervousness, which also drains energy. If you’re often nervous at the beginning of a fight, try to establish a rhythm by getting your jab going and moving around. The quicker your muscles warm up, the more relaxed you’ll become. Double end bags are a great way to work on your timing and accuracy of your punches, as well as loosening up your muscles. This means two things. The first being that you shouldn’t constantly throw combinations one after the other. Pick the right moments to throw them (e.g. when your opponent is hurt or covering up) because the more often you throw, the more likely you’re going to get caught in between them. The second thing is that you should generally limit your combinations to 2-4 punches at a time. Any more than that then you’re more liable to get caught because you tend to slow down. 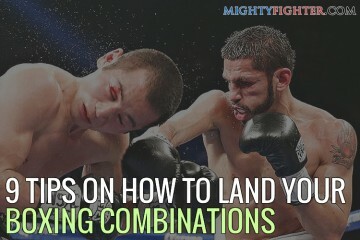 Mix it up by learning a variety of different combinations (read Top 10 Best Boxing Combinations). It’s just as important to know when to throw each one and how to set it up. If you end up being too predictable, then a good counterpuncher will eventually figure you out and start to time your punches. 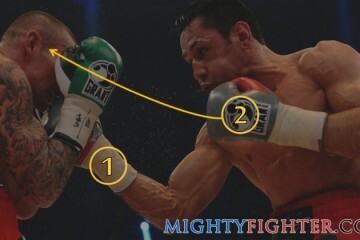 The shorter your punches are, the quicker they will reach the target, and in order to keep your punches short, you need to be within range. Never attempt to throw combinations at long range otherwise you’ll end up over reaching and off balance. The best range to be in is either mid-range or close-range. If you want to have the most fluid combinations then each punch that you throw must be thrown with the correct technique. 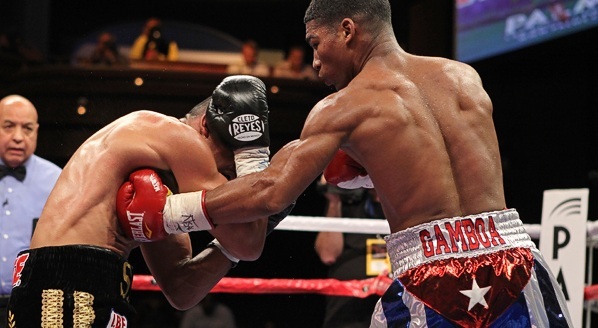 Everything from pivoting your feet, rotating your body to your body positioning before and after each punch are just as important as each other. 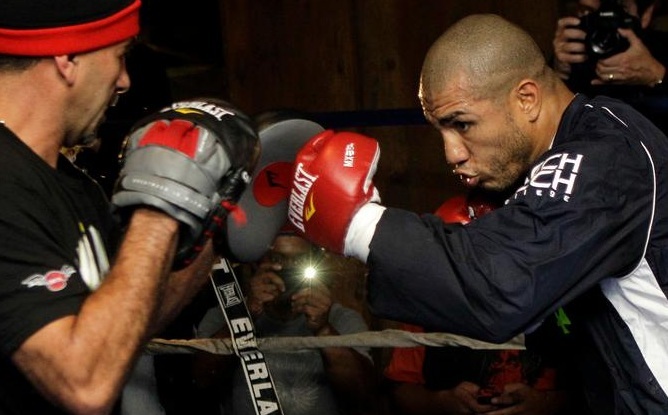 The main punches that you would be using during combinations is the lead hook, uppercut and the cross, so I would recommend that you read those articles and practice how they are connect to each other through a combination. Never deviate your eyes from the target during a combination. No matter what position you’re in, you should always be able to see the target in the corner of your eye. Everytime that you let your eyes wander from the target, not only will is dramatically increase the likelihood of missing a punch, but if you were to get hit by a counter, it would affect you a lot more also. 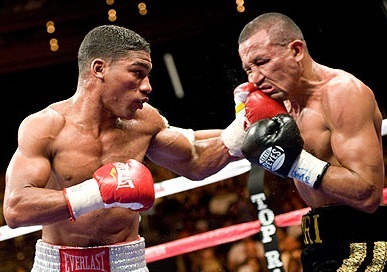 One of the keys to throwing fast punches is to control your breathing. For each punch that you throw, you should breath out. Making a sound helps many fighters to breath out (though some grunts can get annoying!). There can be a downside to this as making a sound let’s your opponent know that you’re going to throw a punch, so if you must make a sound, try to make it quiet. Only take a breath after you’ve thrown your combination, not during. Also, remember not to hold your breath at any point. Combination fluidity is not just about throwing punches with the correct technique, but it’s also about knowing exactly what to follow up with after each punch. For example, you don’t throw three successive hooks to the head as a combination because they don’t flow well together (unless you have super quick hands like Roy Jones Jr). Each punch you throw should be followed up with another that allows you to rotate or pivot in a direction that feels natural, which is usually in the opposite direction to the preceding punch. There are two types of muscle fibers, fast twitch (contracts quick but tires quick also) and slow twitch (contracts slow but keeps up for a longer period). To throw fast combinations requires rapid movement, therefore you must focus on working on your fast twitch muscles. To build fast twitch muscles you would need to do a set of plyometric exercises (exerts maximum force in the shortest time possible) that mimic the movements of specific punches. Using resistance bands are also helpful in improvement contraction motions. When you’re throwing a combination, you want it to be fast and effective, and that can only be achieved by controlling how much power you put into each punch. Not every punch you throw within the combination has to be powerful. If they were, you’d be sacrificing speed, accuracy and balance, three vital components. The initial set of punches you throw are not meant to be thrown with full force, but they’re meant to set up your ‘finisher’ which should be the hardest punch out of all of them. You can practice your combination punching on heavy bags. Here are 10 of the highest rated. The best way to practice combinations is to consistently shadow box so you get your movements and positioning correct, and then implement those combinations with your trainer (or a partner) on the mitts. The movement and positioning when you’re shadow boxing comes first, but when you’ve got the technical aspects down to a tee, then you can shadow box with light weights (0.5kg – 1kg) to tone your muscles. Though it doesn’t build fast twitch muscles, it helps the anaerobic endurance of your muscles which is essential for throwing combinations consistently.